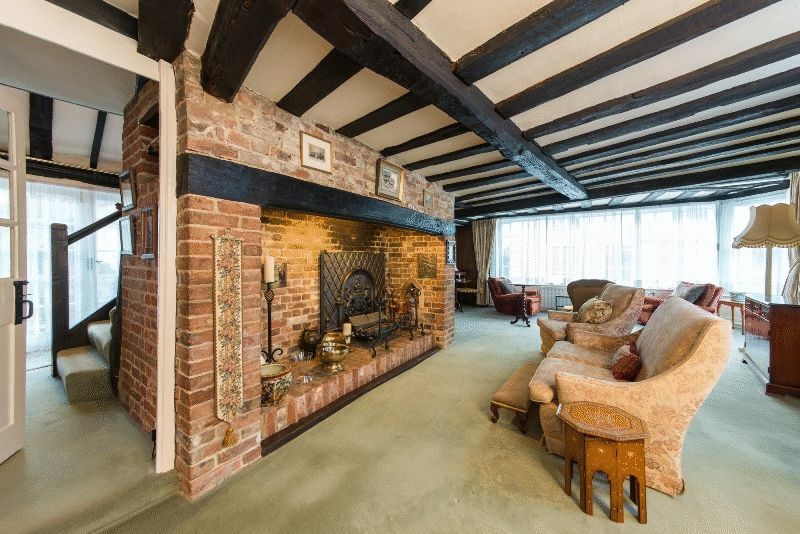 'Thrums' has an abundance of period charm and character and is a significant property within the town. 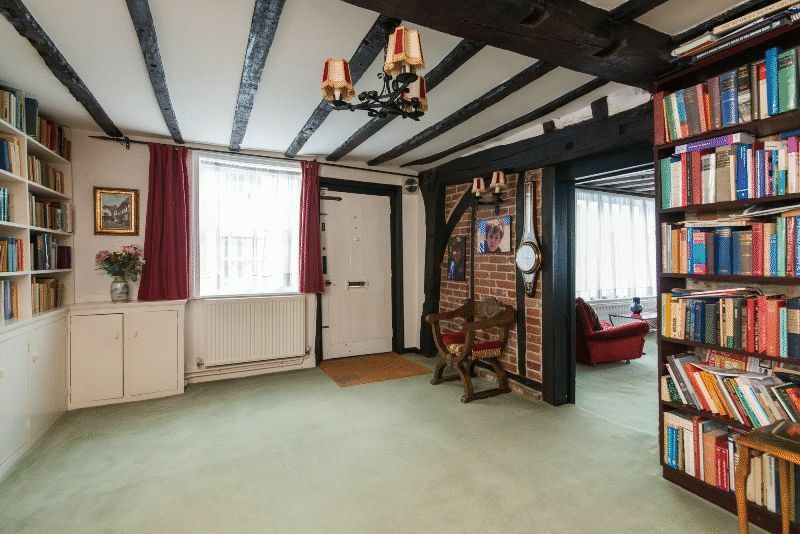 Grade II* listed, the majority of the property dates back to the 16th century and testament to this are the wonderful Tudor period features which adorn the house. 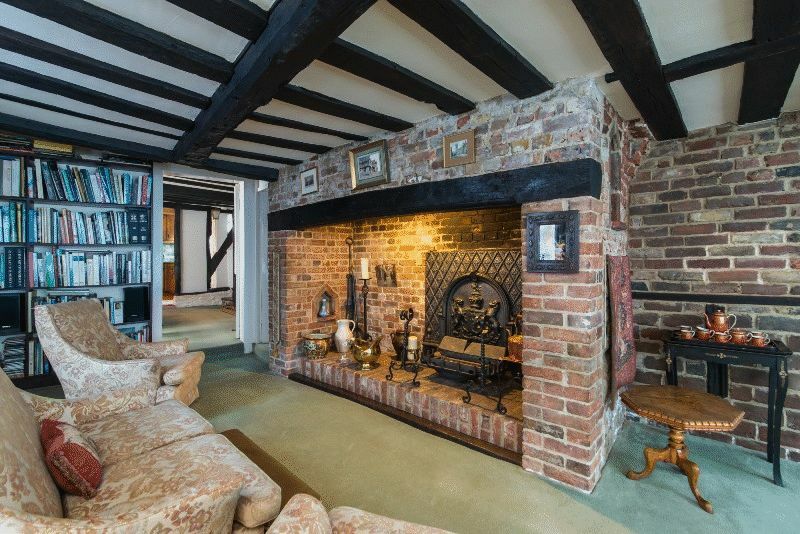 The accommodation, arranged over two floors, is well-proportioned and comprises: - Study, kitchen, sitting room with attractive inglenook fireplace, dining room, and shower room on the ground floor. 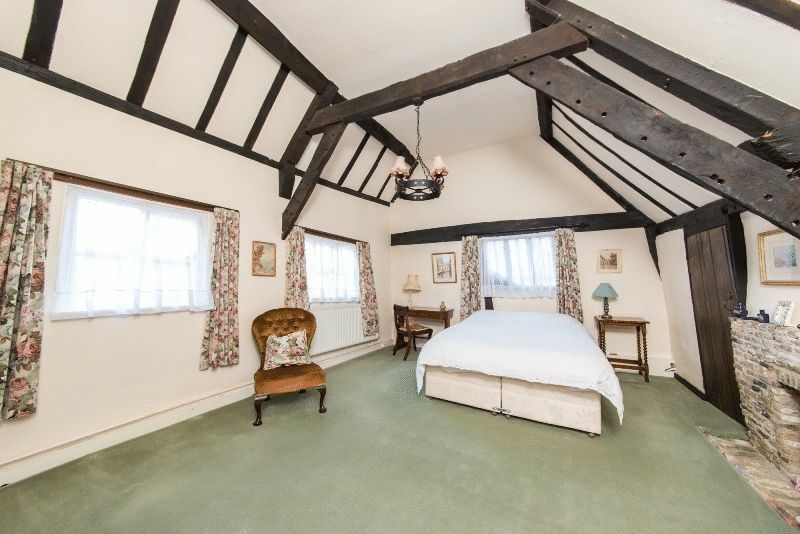 The first floor has an impressive master bedroom with vaulted ceiling and many exposed timbers. 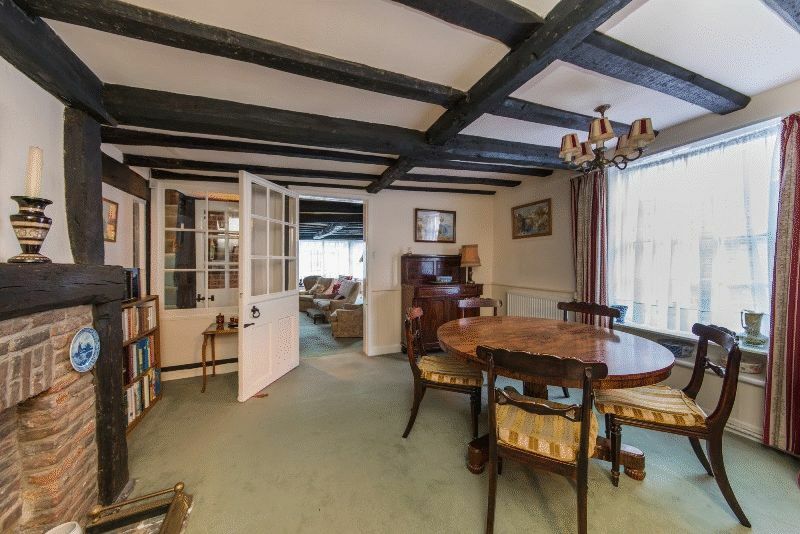 There is access to a dressing room which would also lend itself to being used as a fourth bedroom, having separate access from the main landing. 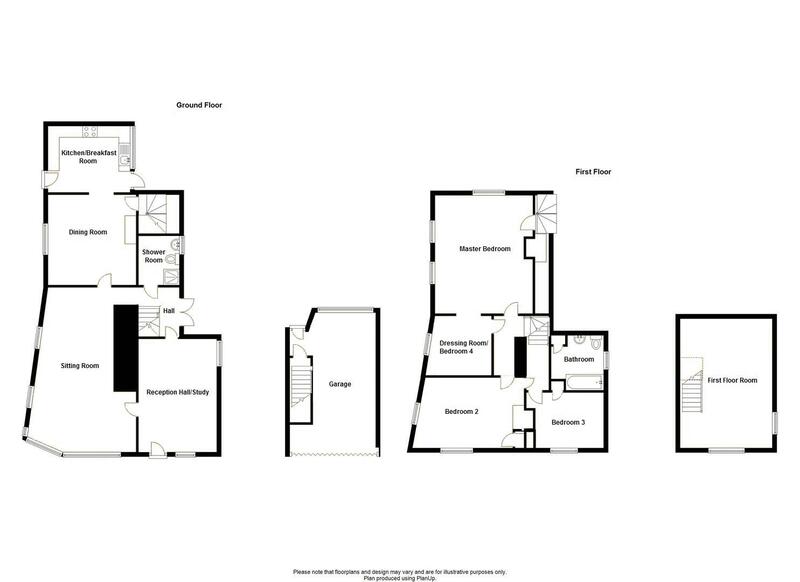 Two further bedrooms and a bathroom complete the first floor. 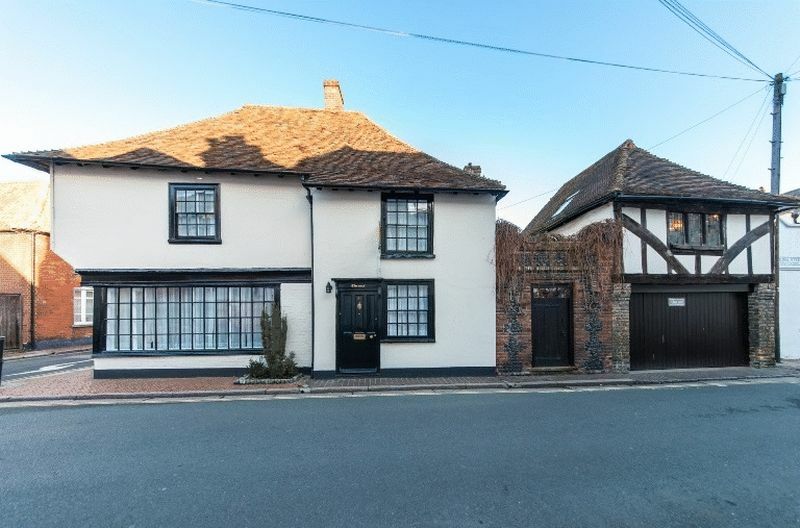 In addition to the main house is the garage annexe above which is an interesting loft style, multi-purpose room ideal for use as ancillary accommodation / games room / office. 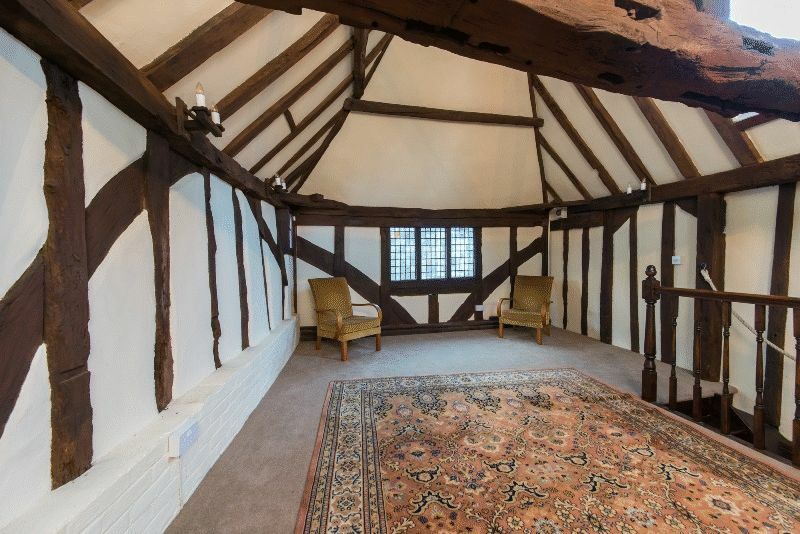 Within this room is a stunning example of an historic 'Crown Post' which is one of the most beautiful architectural structures and truly mediaeval. 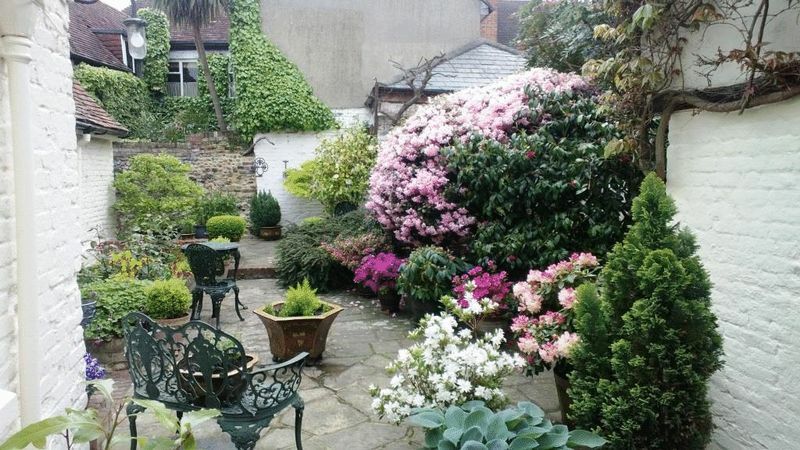 The wonderful, secluded garden complements the home perfectly and is well maintained with an abundance of Camellias and Rhododendrons. 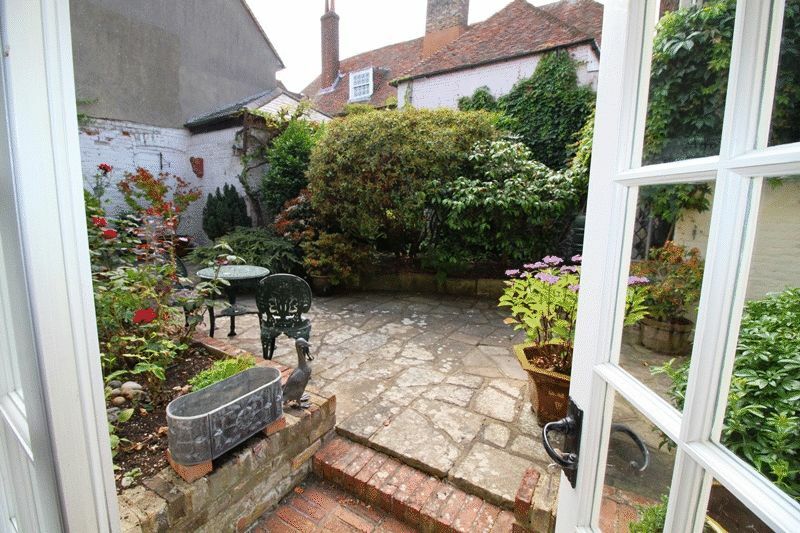 The Kent Peg tiled cat-slide roof can be best appreciated from the rear of the property. 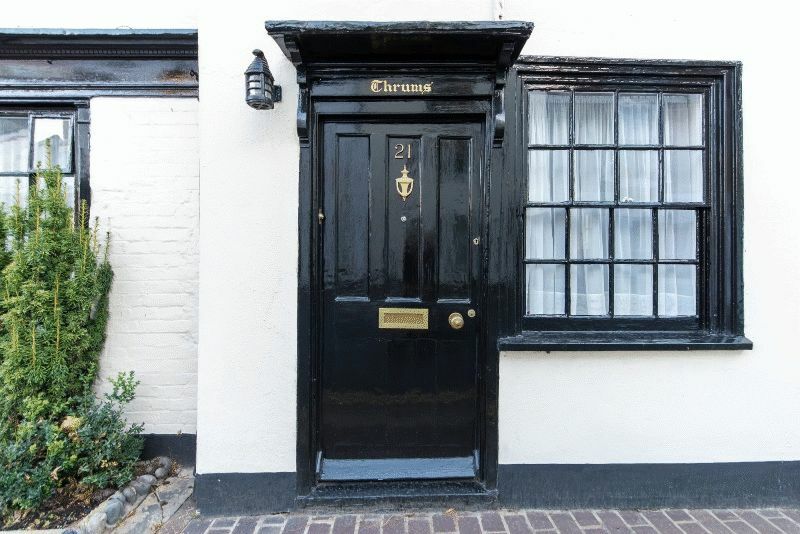 Thrums is centrally located within the historic Cinque Port town of Sandwich which is one of the heritage gems of Kent. 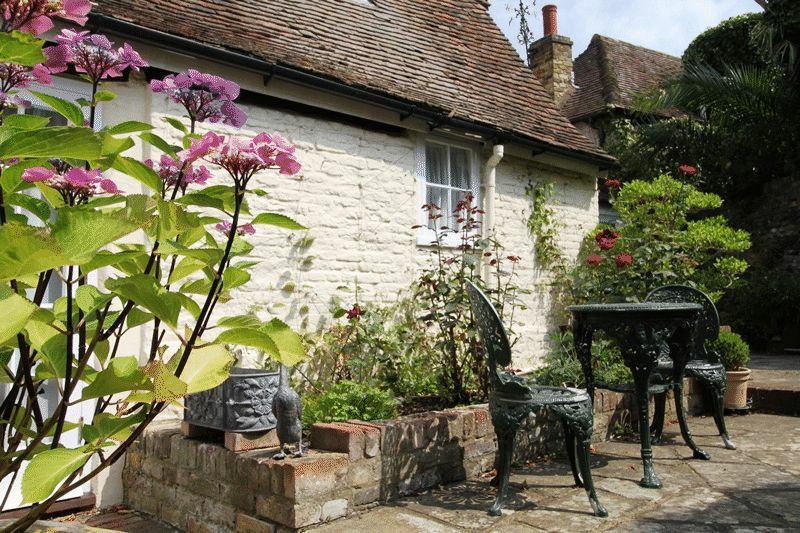 The town offers an extensive range of amenities including a supermarket, independent shops, building society, Post Office, chemist, doctor’s and dentist’s surgeries, restaurants and public houses. There is a good range of schooling for all ages and abilities in Sandwich, including a highly sought-after grammar school. Sandwich railway station connects to London Charing Cross or alternatively the high-speed service to St Pancras. The Channel Port of Dover is approximately 8 miles away and the Cathedral City of Canterbury is within 15 miles. Sandwich is well-known for its golf courses with Royal St George’s about 2 miles from the city centre, which will host the 149th Open in 2020. Secondary entrance door leading onto Short Street. 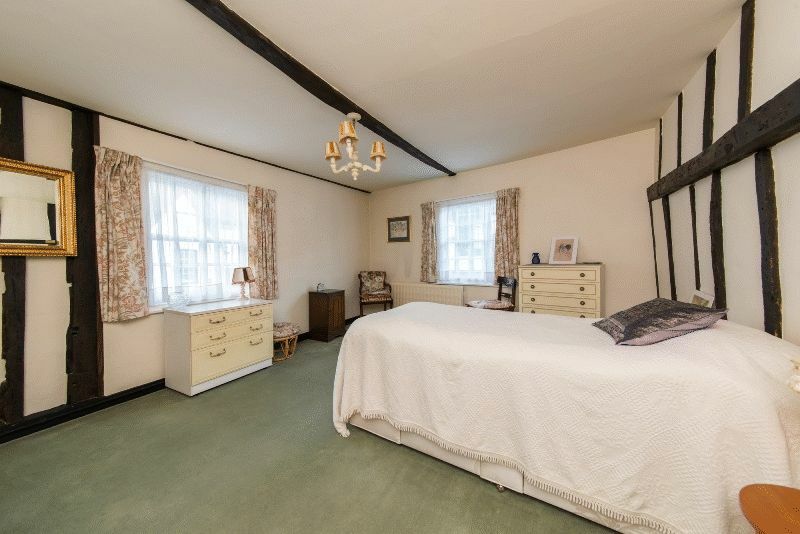 This room is an extension to the main property and was added in the 1970's. 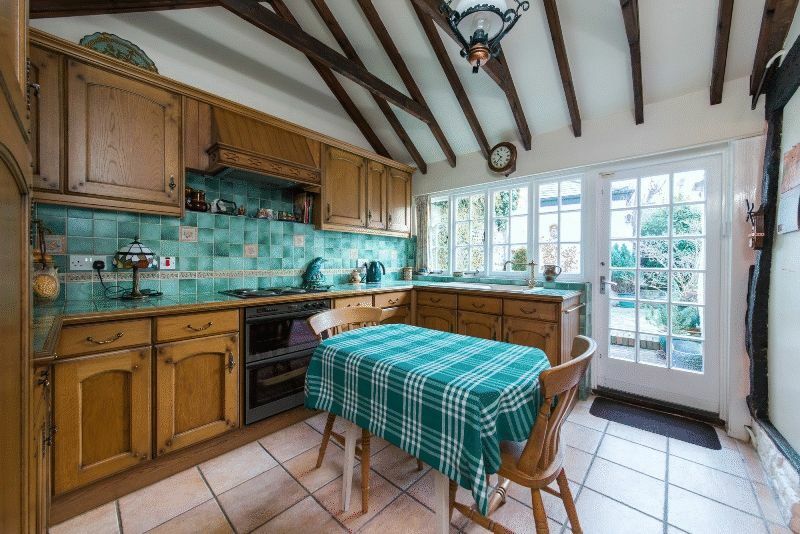 Panelled windows and external glazed panelled door to garden, vaulted ceiling with exposed timbers, ceramic tiled floor, single drainer sink unit, Neff four-ring electric hob with stoves electric oven and grill, extractor above; telephone point. There is a good range of oak storage cupboards with tiled work surfaces and part-tiled walls. Vaulted ceilings ceramic tiled floor, heated towel radiator, shower cubical with Bristan electric shower, decorative part-tiled walls low level WC, wash hand basin, glazed panelled window on to garden, wall-mounted Dimplex electric heater, exposed painted brickwork, ceiling and wall timbers, shaver light and socket, under stairs alcove with space for storage and washing machine. From the inner hall, stairs lead to the first floor. 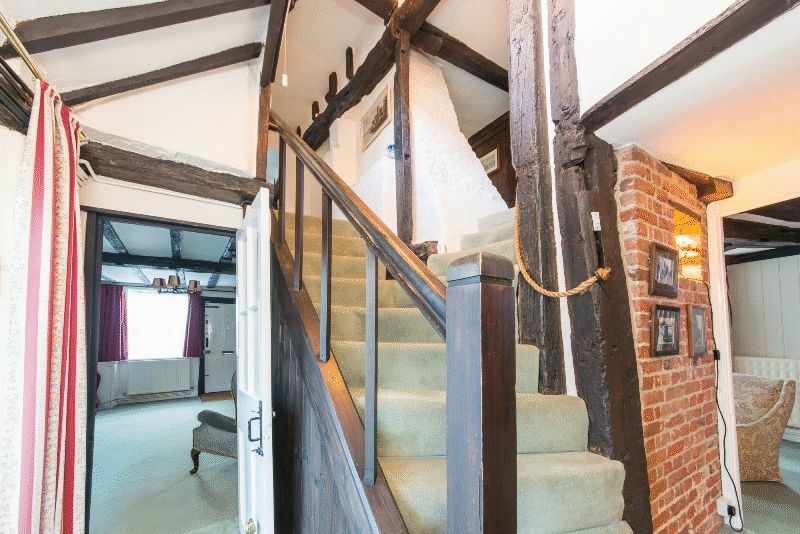 The stair case splits around the chimney breast; - to the right, allows direct access to the Master bedroom and bedroom 2, to the left, there is direct access to the bathroom and bedroom 3, with high level panelled glazed window on to garden. Sash window to side, exposed ceiling and wall timbers, loft access. This room is currently used as a dressing room and has a fitted wardrobe area allowing hanging and storage. 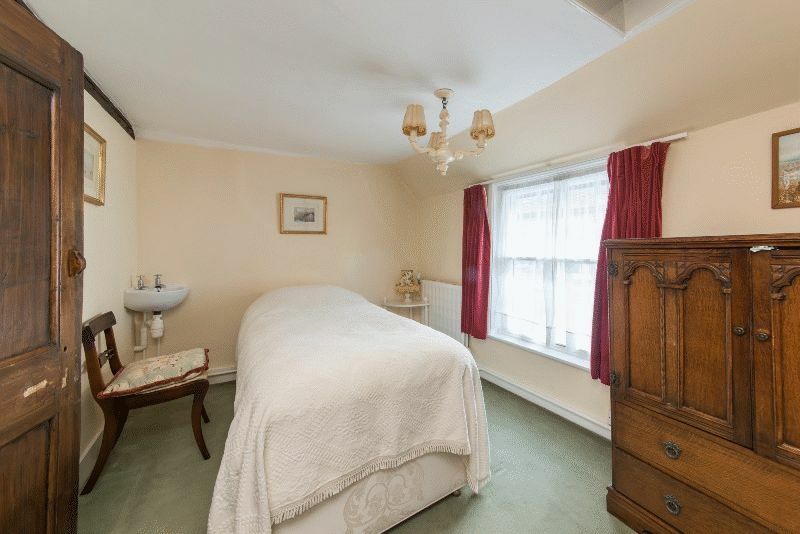 This room could however be converted into a fourth bedroom if so required. 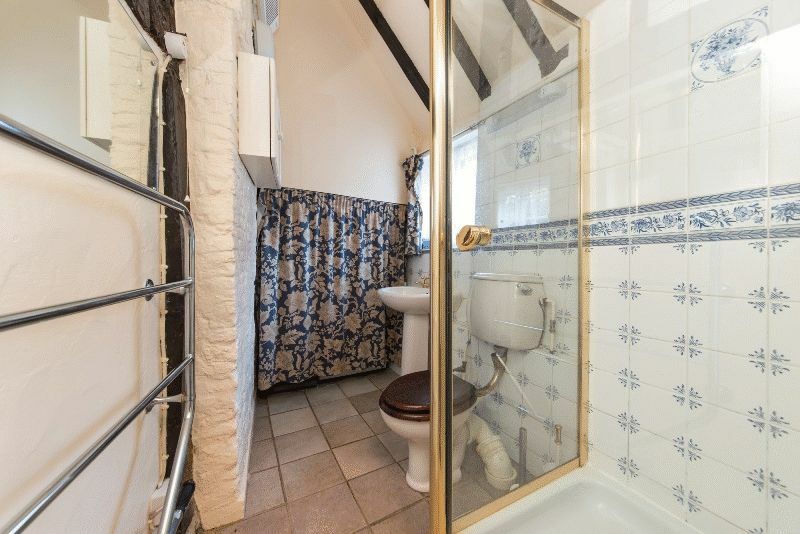 Secondary glazed window to front, small eye-level storage cupboard, exposed wall timbers, corner wall mounted wash basin and door to built-in cupboard, further access to loft. 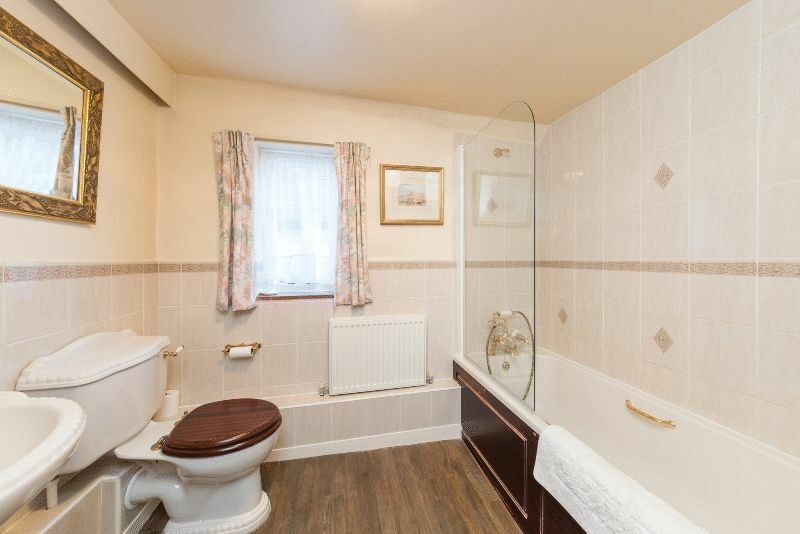 Panelled bath with telephone-style mixer tap and shower attachment, low level WC pedestal wash basin, part-tiled walls, glazed panelled window to garden, shaver socket, heated towel rail, wood-effect vinyl flooring, built-in airing cupboard housing hot water cylinder with immersion and slatted shelving over. 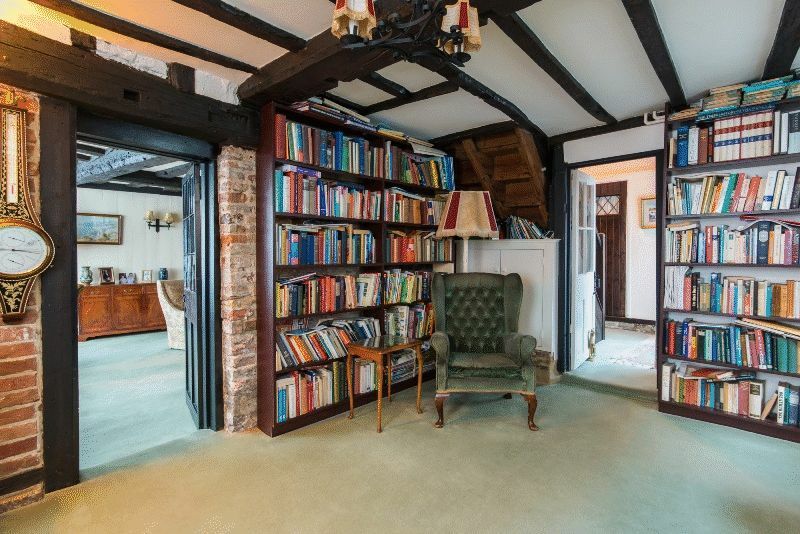 Believed to be the oldest part of the property, together with the study, this room could be used for a host of purposes, and boasts an impressive central medieval Crown Post leading up into the vaulted ceiling. Leaded window to front and further window to side, telephone point and high level Velux window on to garden.